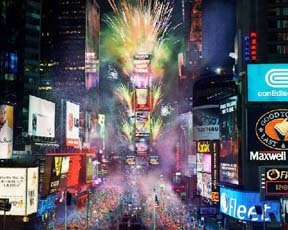 Times Square is going to be the crossroad of the world on New Year's Eve. 750,000 people schduled to be here. Hope to see you here. Q. What is a Ball Drop View Room/Suite? A. With the Ball Drop View Room/Suite, you can view Times Square New Year's Eve Celebrations from the comfort of you guest room or guest suite (which ever one you book). Ball Drop View Rooms are well worth the money. Q. Why is there a price variation among the Ball Drop View Rooms? A. The Ball Drop View Rooms are located on different floors. Very much like seating on a Theater, the higher price Ball Drop View Rooms, the better their views of Times Square. In general the higher price Ball Drop View Rooms are sold out first, they are usually sold out by mid-Aug.
Q. Can we see the Ball Drop from a room not specified as Ball Drop View Room? A. No, rooms and suites with view of Times Square are reserved for guests paying for the Ball Drop View. Rooms and suites not specified as Ball Drop View Rooms are not facing Times Square and therefore not able to see the Ball Drop from the room or suite. Q. Is a City View Room the same as a Ball Drop View Room? A. No, you can only see the City in a City View Room not the New Year Crystal Ball. There are only very limited number of rooms that can see the ball drop. Q. How to book a Ball Drop View Room? A. Call (800) 990-3454 to make your reservation. We have Ball Drop View Rooms and Suites on our inventory. The hotel will charge the New Year's Eve at the time of reservation and you will get a hotel confirmation from with Ball Drop View Room specified. Ball Drop View Room cannot be booked online. Q. Who is charging the room deposit? A. The non-refundable deposit will be charged by the hotel. A room will then be reserved for you out of our block rooms inventory. The room rates are set by the prospective hotels. A. There are a number of hotels in Mahattan, New York City that have Ball Drop View Rooms but only a very limited rooms within these hotels have a Ball Drop View. The bedding arrangement of these rooms are different and the minimum stay requirements varies from hotel to hotel, so this can get quite complicated. It is better for you to let us know your needs and we recommend one from our alotment. They are all 4 stars hotels. Q. Why you need to book with us? A. We specialized in booking Ball Drop View Room. The hotels recognized that it is important have a specialist booking these special rooms in order to ensure that accuracy of booking as only a few rooms are facing the right way to view the ball drop. We do not charge any service fee for the booking. The rates are set by the respective hotel.